Thanks to the camaraderie of a new friend, Otto, I found myself on the Greenland Ice Sheet yesterday afternoon for a MOST unique experience! Otto brought Støt Grønland (an organization that supports the healthy growth of children and youth in Greenland through the sport of football (a.k.a. 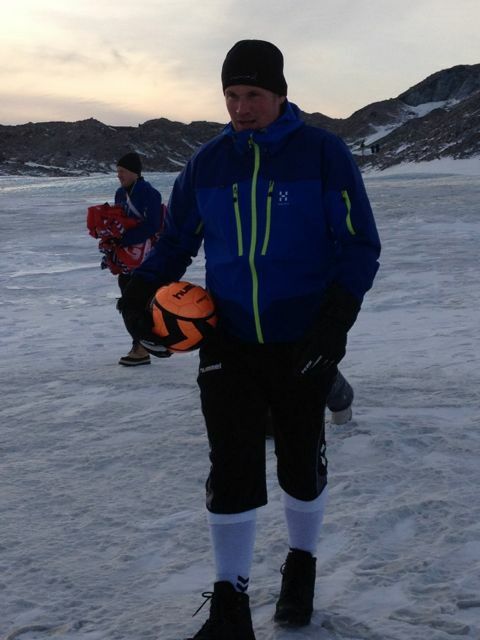 soccer)) to Kangerlussuaq this weekend, and he invited me to be a spectator at his event. 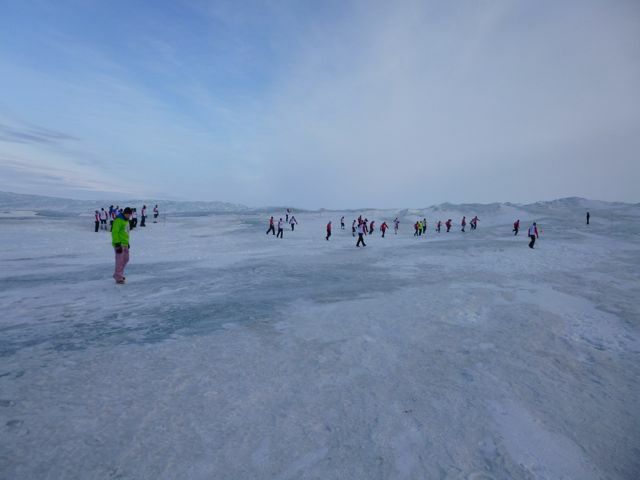 Støt Grønland’s primary activity is playing football games in the most unique places in the world. 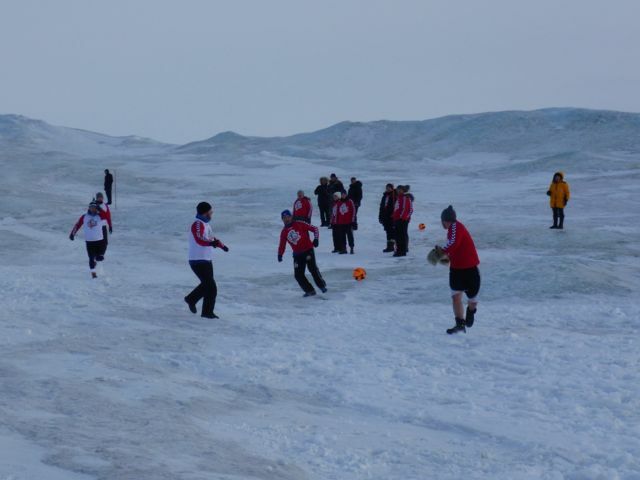 This year, the game was homeward bound and took place on Greenland’s Inland Ice, of all places! It will certainly be hard to top this location for next year’s game! To promote the event, Greenland-raised singer, Julie Berthelsen, recorded a song and music video with the soccer team, which was put on YouTube and iTunes. Not to mention, she was there, in the flesh, playing Goalie for Team Greenland! The organization raised 1 million Danish kroner, which will be distributed evenly in the form of new football balls between the four municipalities in Greenland: Qaasuitsup, Qeqqa, Sermersooq, and Kujalleq. In some towns, this means that every single child will receive a new football ball. Overall, the event garnered a lot of attention – Greenlandic and Danish media were present, in addition to many friends of Støt Grønland! Getting to the Inland Ice is an experience on its own! 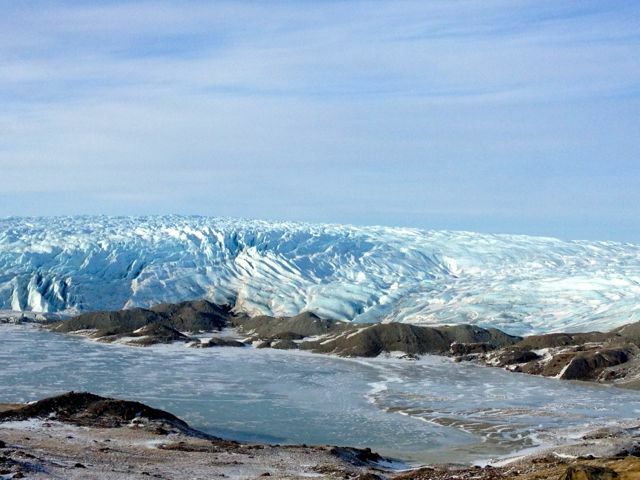 There is one 15 mile- / 25 km-long (bumpy) gravel road from Kangerlussuaq directly to the Inland Ice; you literally almost drive onto the ice! The road itself has an interesting story. Volkswagen built it in 2001 in order to access the Inland Ice and to create a test-driving course on it. In exchange for the right to build, Volkswagen granted Kangerlussuaq tourism businesses the right to use the road in the future. The road runs parallel to the Inland Ice about half the time, so you can actually spot different portions of the glacier before you officially arrive at the edge of the ice. 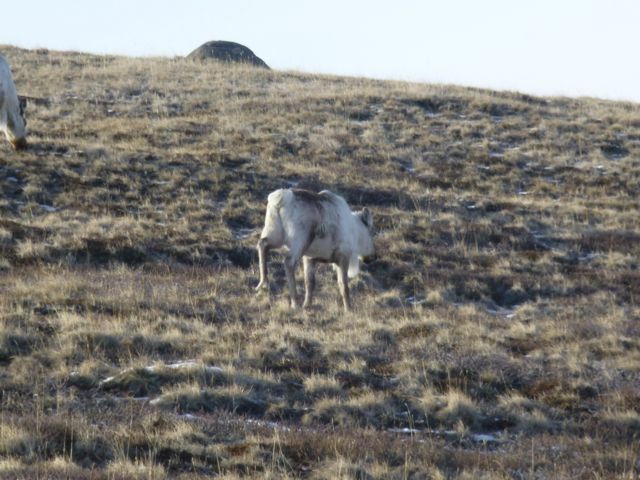 Also along the way, there is the chance to see the Greenlandic wildlife like reindeer and muskox. I had really hoped to spot a muskox, but I settled for reindeer instead. It was nice to see them, though, because I witnessed natural selection at work! In summertime, the reindeer had brown fur but now they have much whiter fur – for camouflage. But unfortunately for this guy here, it has been unseasonably warm, so without snow on the ground, his white fur had the opposite effect! Depending on what type of vehicle you are in (either a private car or one of World of Greenland Arctic Circle’s large all-terrain vehicles), it takes 1-1.5 hours to traverse the road. I had the option to ride with the football players and get the full tourist experience of a guided driving tour and perhaps stopping to take photographs, but in all honestly, I was selfish and did not want to remember my first trip to the Inland Ice being packed like sardines with a bunch of rowdy Danish football players! … and then we were officially on the Inland Ice! It was very wide, and I could see quite far. I think it was deceiving how far I could actually see since there was not any drastic variation in the color or shape where we were. For all I know, I could have been seeing dozens of miles into the distance! The best part about standing on the Inland Ice was knowing that there was ice and snow and air pockets far beneath my feet that have existed for thousands of years! Some of the terrain was ice – extremely slippery and blue and transparent – and some of the terrain was snow – fairly hard packed, but still soft enough that a man’s weight would make his shoes sink in a little bit. Also, in the icy portions you can see black specks suspended in the ice – they are pollution particles that enter the atmosphere from all over the world and then fall once they become too heavy to stay in the air. 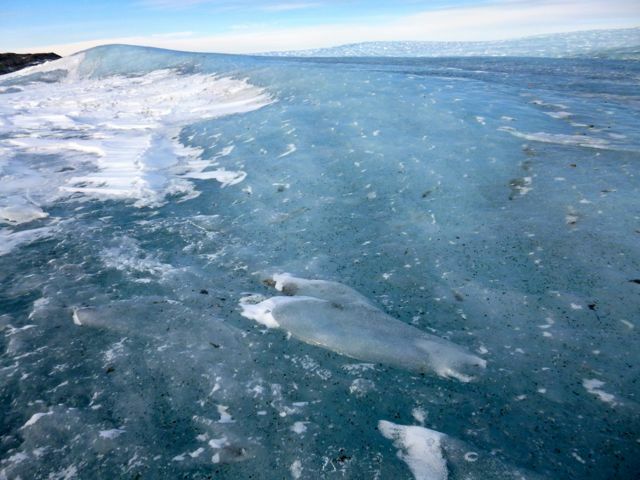 Their existence on the Inland Ice is a great catalyst to its rapid melting because, as basic science goes, dark colors absorb more heat than light colors absorb. So, the more pollution particles there are on the ice, the more melting there is around those spots… which in turn creates more dark areas, because blue water is darker than white snow, and around and around it goes! You know, I have seen the movie “Chasing Ice”, I have read articles about “The Vanishing North”, and I have even witnessed global warming in my own backyard, but to physically be there on one of the most iconic pieces of historical and modern science is just amazing. And scary. So for me, standing on the Inland Ice was mostly an experience to witness science with my own eyes. It was also to get a grasp on immense time rather than immense size. In order to wrap my head around the size of the Inland Ice, I much prefer experiencing it from the air. After two shorter-than-regulation halves, Team Greenland won 3-1! I have to admit, I was very appreciative of the decision to play a shorter game! After a few hours of standing around, it got a bit chilly. In fact, I might have liked to get out on the “field” to keep warm 🙂 My thoughts went to the many tourists who purchase the 2 day/1 night camping trip on the Inland Ice; I hope they are prepared enough for the cold! 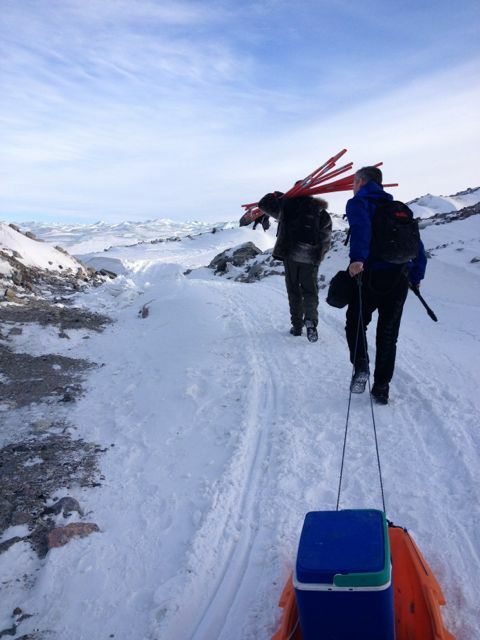 Not to mention the Extreme Adventurers who cross the Inland Ice from coast to coast (nearly) – a month-long adventure! This entry was posted in Big Arctic Five, Greenland, Greenland - Special Trips and tagged Arctic, Big Arctic Five, Destination Arctic Circle, Greenland, Ice and Snow, Ice Cap, Ice Sheet, Inland Ice, Kangerlussuaq, travel by polarphile. Bookmark the permalink.